The interview was conducted on Jun 7, 2013 via Youtube messaging with user "erasmus istanbul". Under this alias the video was uploaded Jun 6, 2013. 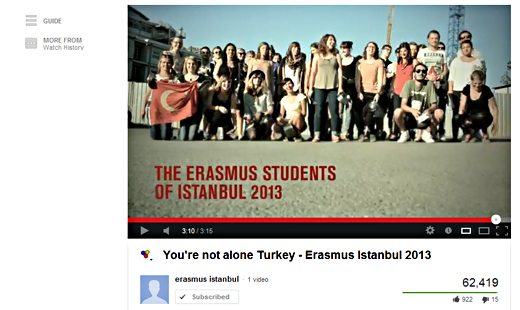 A group of Erasmus students currently living in Istanbul published a support video for the protesters of #occupygezi. I asked the producers about their motives to support the movement. Here's the unedited interview. We came to this beautiful country four months ago to live our Erasmus experience in Istanbul. Since then, we all became friends with young Turkish people and we were able to experience a new culture. I am very sorry to tell you that we do not want our names to be attached with the video since more and more students are being arrested and expelled from the country - in one case even for a simple photo. When did you decide to produce the video? It was in fact a very spontaneous decision to produce the video. The protests have been already going on for two days when we were sitting at home this Sunday evening, trying to study for our upcoming exams whilst our Turkish neighbours were standing on their balconies beating on pots and pans in order to show their support for the protesters in nearby Taksim. It was however not the noise that made it impossible to concentrate but rather the fact that our Turkish friends and fellow students were gathering in the streets that very moment, providing us with pictures and messages from Gezi Park and Besiktas, a quarter of the city were violent clashes with the police erupted that very night that did not receive any attention of the local media. We found it impossible not to undertake any action to show them that we are with them, that we support them and therefore started to organize the shooting of the video the very next day. What do you hope to accomplish with your video? Our Turkish friends have been out on the streets for the last week to fight for their human rights, democracy and more participation. Turkey is not our country, but we feel part of it. And, most of all, we feel like Europe's young ambassadors to Turkey. We wanted to show that Erasmus life is not only about partying and drinking, but also about being part of the European Community. Some of the Erasmus students decided to join the protest on the streets. We decided to go a different way. To support, we use what our generation grew up with: Internet and Social Media. Only now here in Turkey, we realized how important these actually are. We were born and raised in a democratic Europe, where we can freely express our opinions. We want our Turkish friends to have the same opportunity. That's why we want to make their voices heard. This country and its citizens gave us so much over the last months, now we want to give something back and support them.